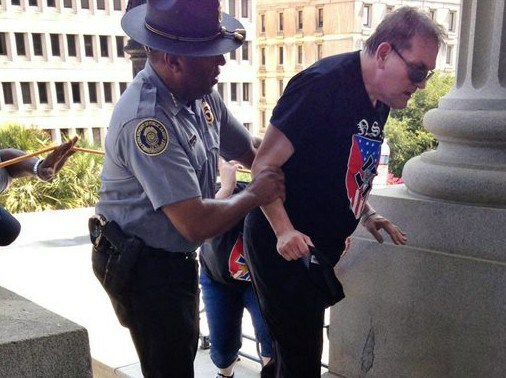 Angry demonstrations took place in Columbia, South Carolina last weekend. White supremacists faced off against counter-protesters. The mounting tensions were aggravated by the sweltering 100-degree temperatures. One of the white supremacists was overcome by the oppressive heat. He was escorted to a cooler spot by Leroy Smith, a black man who runs the state Department of Public Safety. Someone took a photo of this extraordinary act of kindness, and the picture has gone viral on the Internet. It’s good that such acts of love get publicized. Leroy Smith was doing what Jesus tells his followers to do. “You have heard that it was said, ‘Love your neighbor and hate your enemy.’ But I tell you: Love your enemies and pray for those who persecute you…”—Matthew 5:43-44. This entry was posted in Christian Living, Current Events and tagged black man helps white supremacist, demonstrators, illustration, Leroy Smith, love your enemies, Matthew 5:43-44, racial tension, Sermon on the Mount, white supremacists. Bookmark the permalink.